Half brother to: Charles, William (Catherine Ziegler), Heinrich (Auguste Voshage), Friedericka (Fred Wehrmann Sr), August (Dorothea Ohlemkamp), Amelia (Peter H. Lorenzon), Christian (Emma T. Voshage), Caroline (Ernest Bermeier) and Peter Guritz. John took in (an official marriage is not confirmed): Ella D. Lindemann Guritz and her children sometime after the death of her husband George Guritz, John’s younger brother who died September 18, 1926. Funeral services for John Henry Guritz were held from the Gorden Funeral Residence on Monday evening after he died suddenly at his home on route 4, Allegan, Friday. Tuesday morning the body was taken to Beecher, Ill., where services were held with interment at the St. Johns Lutheran Cemetery. 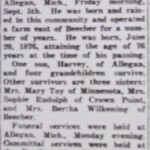 He is survived by one son, Harvey, of route 4, Allegan; 4 grandchildren; 3 sisters: Mrs. Mary Foy, of Ft. Ripley, Minn.; Mrs. Bertha Wilkening, of Beecher, Ill.; and Mrs. Sophia Rudolph of Hammond, Ind., and several nieces and nephews. He was born in Illinois 76 years ago. 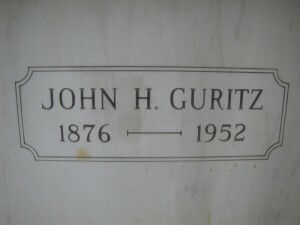 John Guritz, a former resident of this community, passed away in Allegan, Michigan Friday morning, Sept. 5th. He was born and raised in this community and operated a farm east of Beecher for a number of years. He was born June 20, 1876, attaining the age of 76 years at the time of his passing. One son, Harvey, of Allegan and four grandchildren survive. Other survivors are three sisters: Mrs. Mary Foy of Minnesota, Mrs. Sophia Rudolph of Crown Point and Mrs. Bertha Wilkening of Beecher. Funeral services were held at Allegan, Michigan Monday evening. 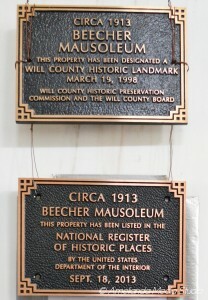 Committal services were held at the Beecher Mausoleum, Tuesday afternoon, at 2:00 o’clock. Rev. Edwin Otte, pastor of St. Luke’s Church, officiated. 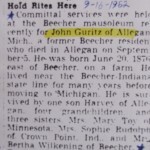 Committal services were held at the Beecher Mausoleum recently for John Guritz of Allegan Mich., a former Beecher resident who died in Allegan on September 5. He was born June 20, 1876 east of Beecher on a farm. He lived near the Beecher-Indiana state line for many years before moving to Michigan. He is survived by one son Harvey of Allegan, four grandchildren and three sisters, Mrs. Mary Foy of Minnesota, Mrs. Sophie Rudolph of Crown Point, Ind., and Mrs. Bertha Wilkening of Beecher. Immediately after marriage, John, Martha and their young son Harvey moved to Jackson, Minnesota and took up farming there. By 1912, they moved back to the Beecher area, Hanover, Lake County, Indiana and bought yet another farm. In 1925, his beloved wife Martha died following an operation at St. James Hospital. 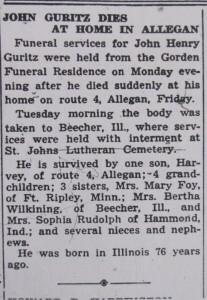 The following year, 1926, his older brother George Heinrich Guritz, husband of Ella D. (nee Lindemann) and the father of six children, ages 1 year to 14 years old, died. George had been in poor health for four years. He was taken suddenly ill and after two short days he was called to answer the final summons. By 1930, John was living on his farm in Lake County, IN with his only son Harvey and his brother George’s widow, Ella, and her six children: Arthur, Melvin, Anna, Earl, Della and George. By 1940, John, Harvey, Ella and the six children had moved to Lawrence, Van Buren, Michigan. In the 1940 census, John & Ella are listed as husband and wife. John died September 5, 1952 in Allegan, Michigan and he was brought home to be laid to rest next to Martha in the Beecher Mausoleum. This entry was posted in Automated Burial Listing, Burial Listing, Burial Location, HEADSTONE, Need full Obituary, Obituary very limited by Sandra. Bookmark the permalink.